Moses returns from Mount Sanai with the Ten Commandments. 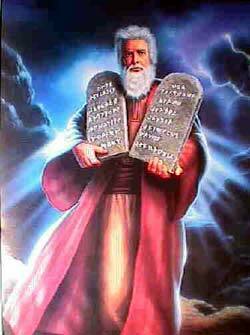 HE TEN COMMANDMENTS which God gave on Mount Sinai were written by Himself on stone tablets. And when Moses came down from the mount, and saw the people worshiping the gold calf, in his anger he threw them down, and they were broken. But after God, at Moses' prayer, had so far forgiven the sin of the Israelites as not to destroy them all, He bade moses hew two tables of stone, like the first, and bring them to Him on Mount Sinai, that He might again give them his commandments. Moses did so, and went up early in the morning to the mount. He was in the mount with God forty days and nights, neither eating nor drinking; and when he came down with the stone tables, on which the commandments had been again written, his face was so bright that the people could not look at him. He had to cover himself with a veil while he talked to them. God had bidden him tell the people of Israel that if they kept His commandments, He would bless them, and make them prosperous; but if they did not keep them, He would give them into the power of their enemies, and afflict them with all kinds of troubles. God also would have them prepare a place in which He might be worshiped; and, as the people were traveling onward to the promised land, He bade them make it like a tent, which might be carried along with them, and set up when they rested on their march. This tent was called the Tabernacle; and God gave exact directions how it was to be made, and also how they were to make the altar on which sacrifice was to be offered, and the ark, which was a chest, to hold the tables of stone. The people were glad to do what God desired them in this matter, and brought such large quantities of precious materials to construct the Tabernacle, and those other things that were to be in it, that at last Moses was obliged to bid them bring no more. When all was completed, God commanded that the Tabernacle should be set up in the wilderness of Sinai. And when it was set up. His glory filled it; a cloud also rested upon it by day, and at night a light like fire. As long as God would have the children of Israel remain in their camp in the wilderness, this cloud remained on the Tabernacle; when He would have them go on their journey, the cloud was taken up from it, and went before them. In this way the people knew whether God would have them travel on, or stay where they were.